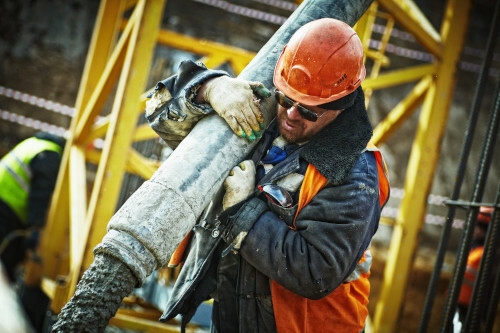 Major repair works are scheduled for our estate from 8th April to late May (7 or 8 Weeks works have been scheduled, but it is possible that these could over-run). Here at Essential Trading Quality Assurance we take the integrity of all the foods we sell very seriously. We were conducting a HACCP review of our herbs and spices and found a specification recipe had changed before the labelling team had updated the pack label. 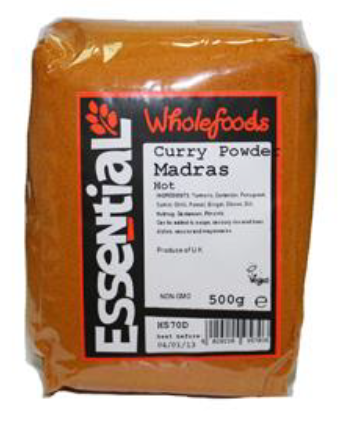 As our products are fully traceable, we recalled the hot curry powder immediately, contacting all affected customers and the Food Standards Agency, Allergy UK and Anaphylaxis Campaign. We have conducted a root cause analysis in order to prevent any further omissions happening again, working with our suppliers and manufacturing team to ensure our labels are clear, correct and fully compliant. We apologise to anyone affected by this and are happy to answer any queries you might have. 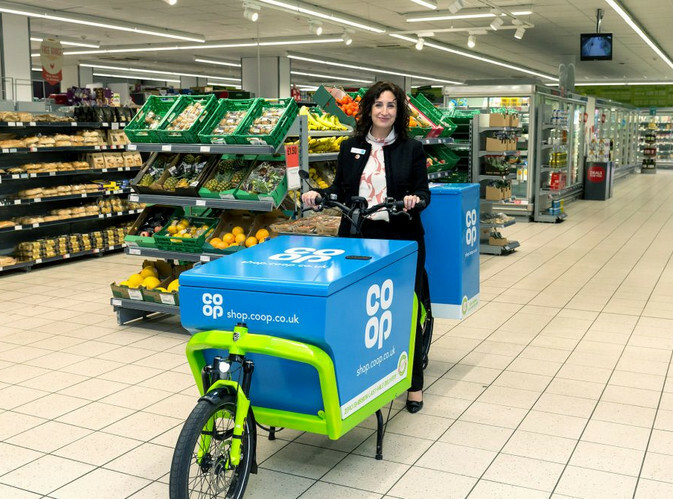 "The Co-op Group is launching a home delivery service for groceries, beginning with a trial in nine London stores. It is the first time the organisation has offered online grocery deliveries via a dedicated website, shop.coop.co.uk, and follows a recent trial of autonomous robot deliveries in Milton Keynes and a free service by taxi for groceries at eight other UK stores. The new service will initially be available to shoppers within a four kilometre radius of a store on the Kings Road in Chelsea, before being rolled out to eight more London stores. Orders will be fulfilled using zero emission electric cargo bikes, from e-cargobikes.com"
If you want to know more click on the link. It’s nearly time for the annual awards for co-operatives in the UK – and nominations are now open. a) Leading Co-operative of the Year (for co-ops with turnover of more than £30m). If you want to read more about this, follow the link! For two weeks every year, thousands of people, charities, companies and groups across the UK come together to celebrate the people who grow our food. These people very often live in some of the poorest countries in the world and are exploited and badly paid. 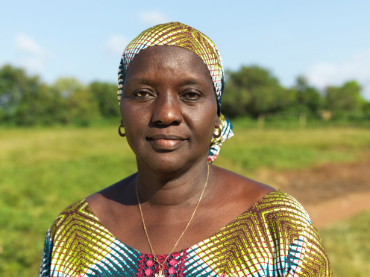 This year the Fairtrade Foundation is focusing on the people – in particular the women – who grow the cocoa in the chocolate we love so much. Join the Fairtrade Fortnight campaign following the link. 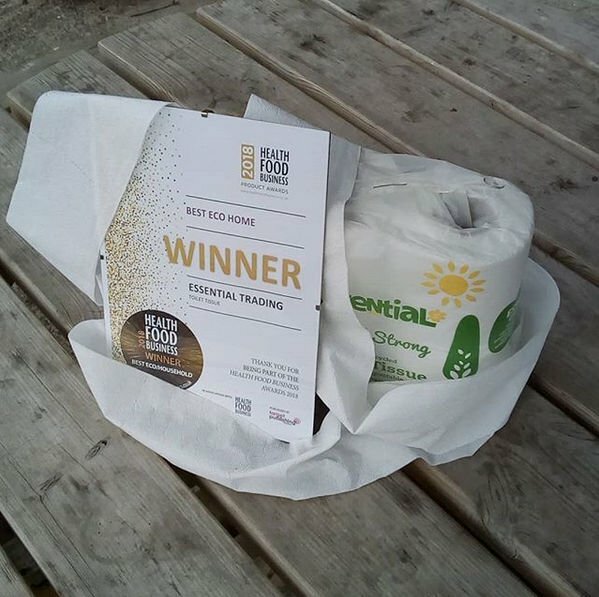 Our toilet tissue has won the Best Eco Home award! 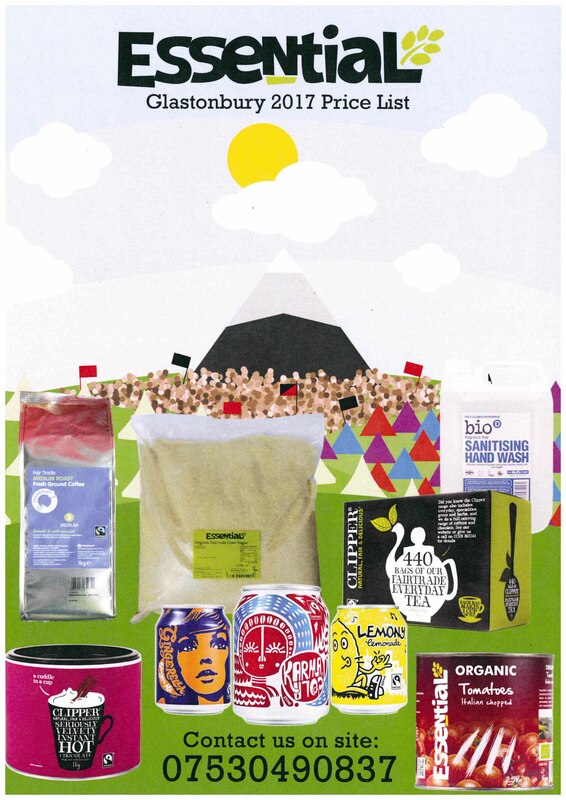 Thank you, Health Food Business magazine and thanks to all those people who spent their time voting online! Our Toilet Tissue recycled paper production uses 40% to 60% less energy than making new paper from trees, and reduces contribution to air pollution by 95%. Made from 100% washed recycled paper, unbleached and undyed. Let me introduce to you our new Black Beans! 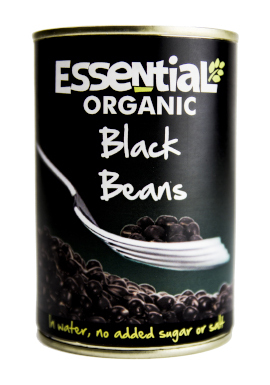 A welcome addition bringing the Essential range of organic tinned pulses up to number eight: Black Beans. Used as a food in the Americas for 7000 years, Black Beans are a good source of protein and soluble fibre. Made using just water and black beans: so added salt or sugar, and with an Rsp of less than a quid! In the end, it all comes down to this, right? Be morally responsible for what we buy. Do our part to improve society and try to help the planet and the wildlife in it. 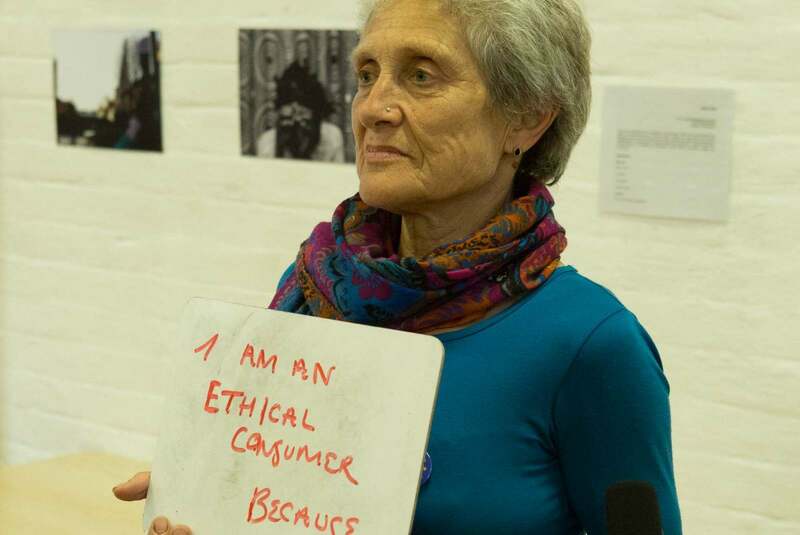 That's why Essential Trading supports the campaign launched by the Ethical Consumer magazine "Pledge to be an Ethical Consumer", which you can endorse if you follow the link. 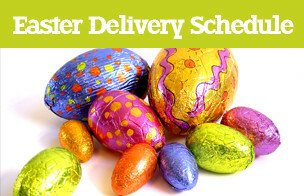 As of now we are no longer able to take extras after 11am on the working day before delivery. In order for us to continue offering next day delivery we have to make a few changes, among these the discontinuation of extras. Everything you need to order should be with us by 11am on the working day before delivery, so that we can make sure that our trucks are loaded safely and securely, to minimise damages and to ensure that we are within the weight limit for each vehicle. Our Transport managers can then decide which trucks are doing which runs depending on the weights and number of deliveries. The drivers can work out their loading plans so that the pallets are positioned correctly on the trucks for safe unloading. - The weights are incorrect and the runs have to be reorganised. 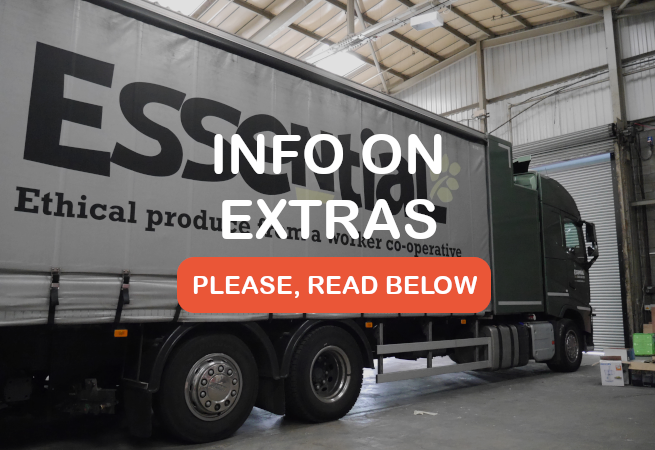 - Extras may cause an order to be too big to fit on the pallet space allocated. - Driver’s loading plans may be incorrect after orders are moved. - Trying to fit extras onto existing orders can cause damage to stock. We hope you appreciate our reasons for making this change. We trust that this will enable us to safeguard our ability to continue to provide a next-day delivery service. 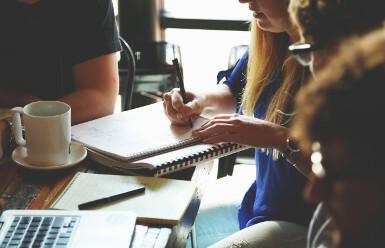 Co-operatives UK has announced the theme for next year’s Co-operatives Fortnight (24 June-7 July), which will focus on creating a co-operation nation. The Fortnight campaign was launched on November 22nd at the Practitioners Forum in Manchester. Co-operatives UK, the apex body for the sector, is calling on all co-operatives to join the campaign by carrying out an act of co-operation, and film or photograph it for social media using the hashtag #CoopFortnight/ They should also nominate or tag another co-op to do the same. Read more clicking on the link. We are very pleased to announce that we have redesigned the label of the entire range of tomato products. I hope you like it. 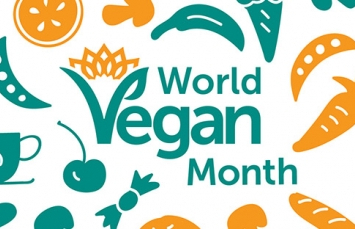 People around the world choose to mark World Vegan Month in an array of different ways. You could host a vegan lunch at work or a vegan dinner party with friends; commit to taking part in vegan outreach in your local community; share your favourite vegan recipes on social media or even challenge your friends, family or work colleagues to go vegan for 30 days by taking our Vegan Pledge. However you choose to mark World Vegan Month, be sure to share it far and wide using the #WorldVeganMonth and #WorldVeganDay hashtags on social media. 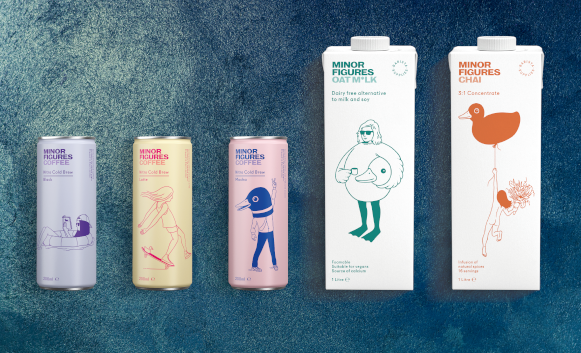 We are really delighted to introduce you to our new supplier: Minor Figures. Their fantastic products, among which is a fantastic foamable oat milk, will be available for you early next week. The World Vegan Day (and Month) is coming! 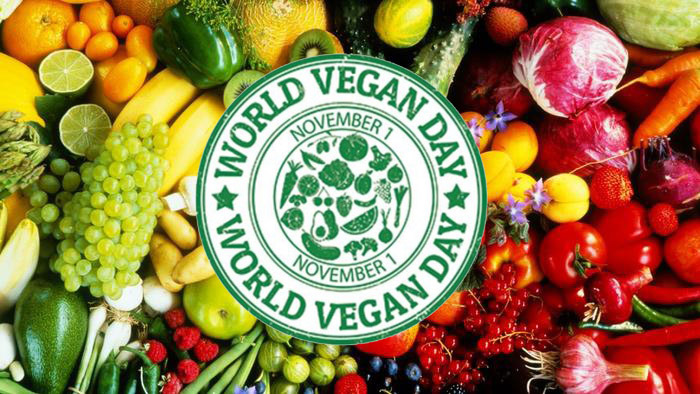 This event was established in 1994 by Louise Wallis, then Chair of The Vegan Society in the United Kingdom, to commemorate the 50th anniversary of the founding of the organisation and the coining of the terms "vegan" and "veganism". An important notice about the Open Day! In about 10 days we will celebrate our Open Day! We are hoping to see you here, but we also want to let you know that we'll be closing early on Friday 28th of September to have everything ready. If you are planning to place an order for delivery on Monday 1st (or collection on Friday 28th), please place your order by 11:00am on Thursday 27th. 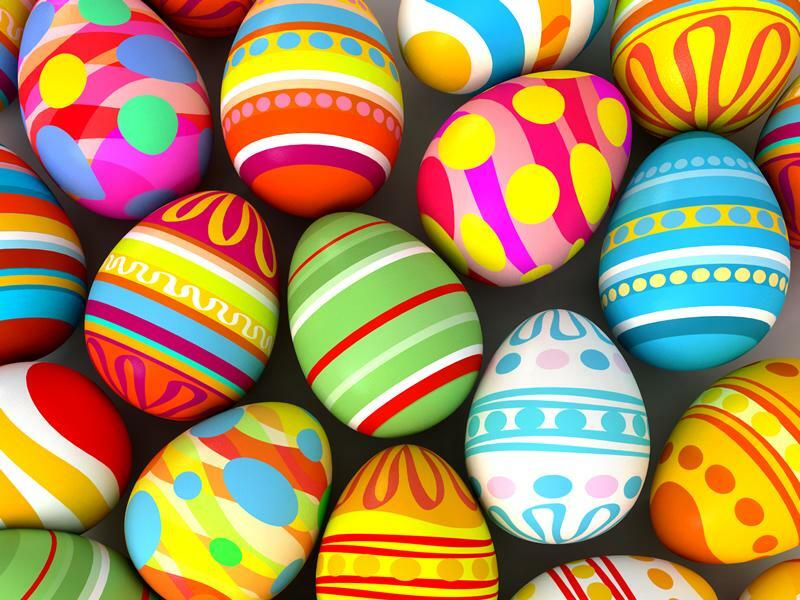 We will not be able to take extras on the Friday, as picking will be completed by midday. Thank you for your co-operation, and we look forward to seeing you there! 1. 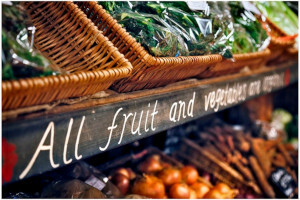 Organic food is no healthier for you. 2. Organic is needlessly expensive. 3. Organic is a scam. 4. Organic products are not available. Do you know why you should be involved? Follow the link. "The Co-operative Economy, published annually by Co-operatives UK, is the nation’s only comprehensive report on the UK’s co-operative sector. It reveals turnover, membership and employee figures for thousands of businesses across the UK". Have a look at this report, and find out why the "co-operative option" is growing, and is doing business better, across different sectors and different nations. 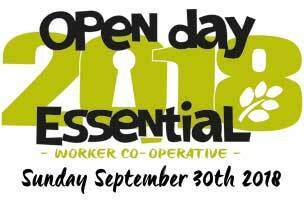 The Worker Co-op Weekend is a yearly gathering of worker co-ops from all over the UK organised by Cooperatives UK. This year it was in an outdoor centre in Derbyshire with dorm and camping options. had a social around a fire in the field, with a good dose of drunken singing. In total, there were about 40 people attending. We finished on Sunday early afternoon. 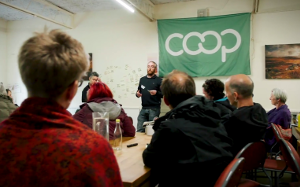 There were lots of worker co-ops attending – food co-ops were the majority but there were also co-ops working in very different industries, such as design, IT, ceramics, tools for the farming industry, a laundrette…it was very varied. There were also various individuals from colleges and universities researching the worker co-op movement. We stop selling water in plastic bottles. 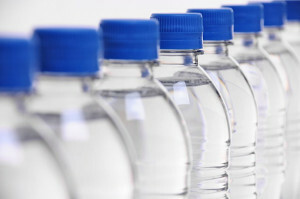 We’re proud to announce that we are no longer selling water in plastic bottles. We've been waiting for the last bottle to leave the warehouse - and it's finally gone! (You can still buy water in glass bottles from us, though). Essential Trading are firmly against the use of single-use plastics and we're innovating and making changes wherever we can. You can read out statement on the use of plastic, following the link. Please note that Essential Trading Open day is a trade event open to registered customers of Essential only. We've had a long and busy festival season but it's drawing to an end. We've delivered to over 15 music festivals this summer; all over the country! It seems as if there are more springing up every year. We're proud to be part of this alternative culture that is becoming more and more widespread and also happy to be ensuring that festival goers have access to wholesome and ethical food choices while they party! Our latest venture was to wholesale at Shambala this year in a similar manner but a much smaller scale than we do at Glastonbury- having a wholesale shop onsite aswell as delivering to businesses before the gates open. Ari from our distribution and goods in teams, Andrea from manufacturing and health and safety and Paul one of our drivers represented the coop onsite during the glorious weekend- big thanks to them. It was a successful venture and we're really glad to be involved with Shambala's mission to be a totally vegetarian festival. We want to publicly thank all our drivers for enduring the mud, scorching heat and challenging driving conditions out in the fields this summer and the festival sales team for coordinating the drops! We hope you spied some of our products being served in yurts, domes, marquees, stages, dancefloors and treehouses this season and would love to see some festival pictures, especially eating some delicious vegetarian food, tag us in your instagram pics at @essentialtrading and use our hashtag #goodfoodisessential. 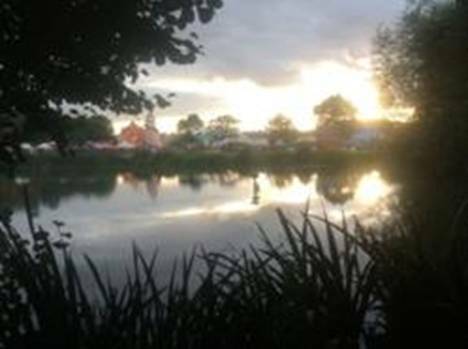 A small - but perfectly formed - set of Essential staff will be making their way to Pilton this weekend to start setting up our annual on-site wholesale operation at Glastonbury Festival. We're looking forward to seeing all our stallholder friends once again, and ensuring that no Fairtrade coffee stall or organic pizzaria runs out of supplies for the duration. We hope to update our progress and bring regular news and views from the Festival via our Facebook page - hope to see you there! The Year of the Jackfruit. 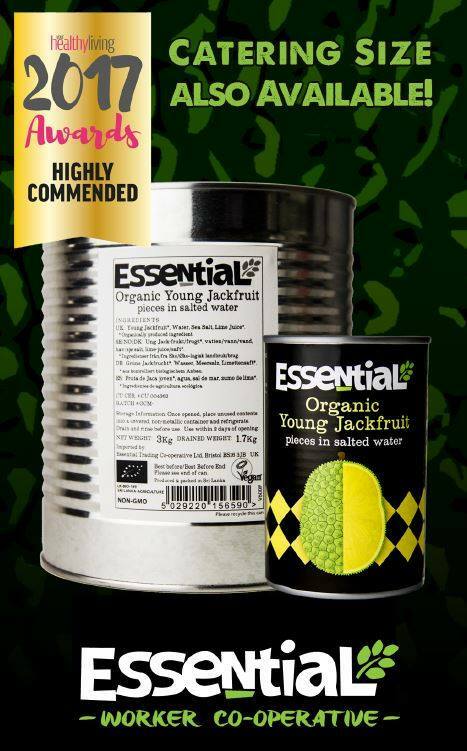 So Jack came to Bristol as Essential introduced our new organic offering at VegfestUK 2017. We piled cans of Jackfruit high - and started cooking up a seemingly never-ending supply of samples. A fabulous weekend - big UP to the organisers - for another fantastic event - we cooked, we chatted and informed, we sold.. The level of friendliness and interest was unparalleled in any recent show (of course!) It was great to connect and re-connect with people from all across the country (and beyond). It was brilliant to be able to introduce this new ingredient (to the UK market) which, it turned out, a great many people had heard of, but not yet seen / tried. It was great introducing Jack to so many new people - this ingredient’s versatility is limited only by imagination - so feel free to share any recipes / suggestions you have onto our Facebook page (the recipe we used is posted there in the 'Notes' section) - we’d love to see them - and try them ourselves! Thanks to everyone who came along.. We’re very sad to hear that this will be the last Bristol Vegfest - we’re secretly hoping that this won’t be the case - but whatever the case - it’s been a real blast over the 15 years and it’s been great to see the meteoric rise of interest in veganism that Bristol Vegan Fayre / Vegfest has been a prime part of - and it’s been a real joy to have helped sponsor / taken part in it over all those years.. Yet for now - Goodbye Vegfest (Bristol) it will live on long in our hearts.. Essential is donating to Caring at Christmas for the 18th consecutive year. 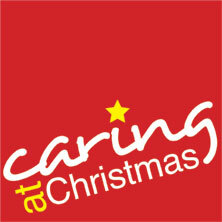 Caring at Christmas is a registered charity which aims to improve the wellbeing of homeless people in the Bristol area by providing a safe and welcoming shelter, food and support for homeless people over the Christmas period. They provide practical information to homeless people and other stakeholders and tackle the causes of homelessness through working jointly with other charities and associations. Over the Christmas week, they run a Christmas Shelter for people who are homeless or vulnerably housed in Bristol. This includes accommodation, food, medical services and entertainment. Alcohol products available from Essential again! We are happy to announce to all of our customers that we have obtained the necessary certification and licensing from the HMRC and that alcohol products will once again be available to be purchased from Essential. We apologise for any inconvenience caused during this time and thank you for your patience. Essential Trading returned to VegFest this May to take part in the festivities and connect with the growing vegan community. We decided to come out swinging – inspired by the recent news that there are now over half a million vegans (and counting) in the UK – and sponsor the event to help show our continued support for healthy eating, concern for protecting the environment and opposition to the exploitation of animals. Taking up a prominent position directly opposite the main entrance we were there to welcome people to the event and let them know about their local vegetarian worker co-operative. We had a range of samples including our new Dark Chocolate Coated Puffed Quinoa (M510Z) which went down a treat as well as classics such as our Organic Fairtrade Dark Chocolate Spread (S103P) and our Organic Crunchy Peanut Butter (S164P). Thousands of people turned out despite the intermittent rain to try some tasty vegan food and dance to some sweet vegan music provided by the likes of Macka B, Stereo MC’s and Marshall Jefferson who all appeared on the Essential Trading sponsored main stage over the weekend. Thank you to everyone who helped organise Bristol VegFest and to everyone who came and saw us, tried our delicious samples, bought our tasty products and had so many nice things to say about us! 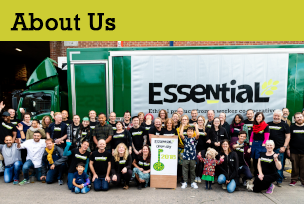 Special thank goes to our tradeshow co-ordinator Ava and the VegFest team (Ariyana, Dawn, Ian, Louise, Kaden, Phil and Rich) for giving up their weekend to help support the co-operative and spread the good word about Essential Trading! No Room for Monkey Business at Essential Trading! Essential Trading is saddened by the recent expose of the coconut farming industry which revealed that a number of farms are exploiting monkey labour to pick their coconuts. Many of the monkeys used on these farms were abducted as infants and sent to special 'schools' were they are taught to pick up to 1,000 coconuts a day. They are subject to terrible abuse at the hands of their trainers and prevented from carrying out natural behaviours which causes psychological damage. Essential Trading produces a range of organic coconut products all of which is sourced from sustainable coconut farms in Sri Lanka. We have visited the farms personally to ensure that they maintain the high standards we expect and that our customers expect when purchasing products from a company like Essential. 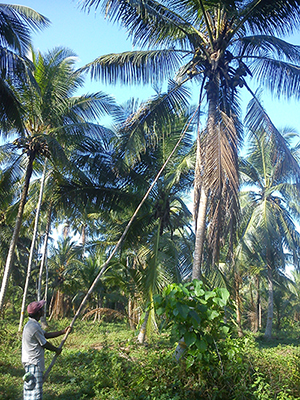 The coconuts are harvested by hard working (human) farmers either by climbing the tree themselves or by using a long bamboo rod to pluck the coconuts from the tree tops. No monkeys are involved in the harvesting or production process of any Essential brand products. As a company we are opposed to the exploitation of animals and strongly condemn the use of monkeys on coconut farms. Essential are proud to support the work of Wild Futures, the country's leading primate welfare and conservation charity. We have supplied Wild Futures with organic and fair trade whole foods for several years as well as making numerous donations to the charity. You can rest easy when purchasing Essential Trading coconut products in the knowledge that no monkeys were involved in the production process and that by buying from Essential Trading you are supporting hard working Sri Lankan farmers and a more sustainable, organic future. 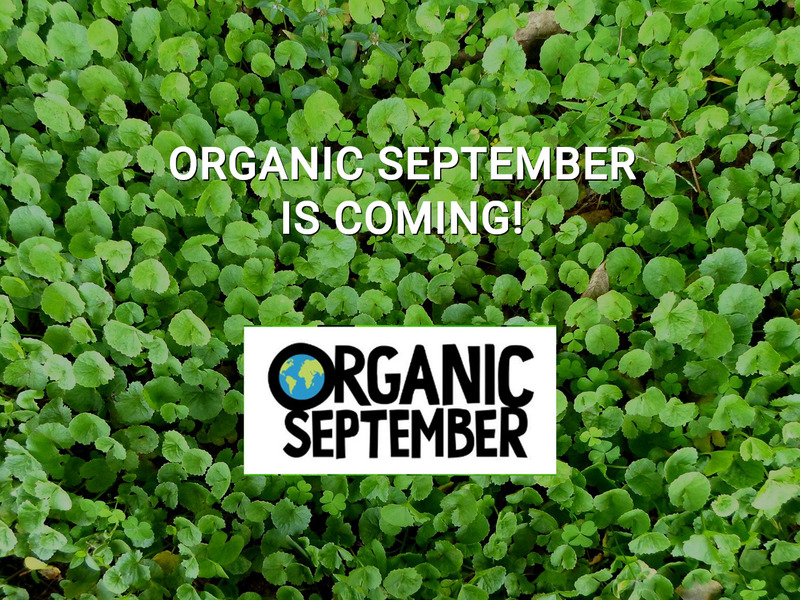 Essential Trading is excited to announce a new organic supplier for Essential Oat products. The new partnership is a UK collaboration thanks to an introduction from OF&G (Organic Farmers & Growers) who inspect and certify organic farms, mills and other enterprises in the UK. The organic oats will come from an agricultural co-operative, and will assure the very best quality, purity and flavour for the oats in all Essential products including Jumbo Oats, Porridge Oats, Muesli and Granola mixes and special fruit Porridge Blends, each in a variety of sizes. Even Essential’s range of organic flapjacks, made from a range of Essential ingredients, will be affected by the change. “The change is a result of a long and careful decision process for us and we are really delighted to have found a new supplier that shares our co-operative ethos and can provide such a top quality product for our range. Our oats are sourced from a very established organic mill in Northern Ireland that is part of a farmer-owned cooperative. We look forward to introducing our organic UK grown oats from this autumn”. * Essential Jumbo Oats are oat groats, rolled flat, partially pre-cooked in steam. * Essential Porridge Oats are made with rolled pinhead oatmeal, partially pre-cooked in steam, for a creamier porridge. There is no need to pre-soak Essential Porridge oats. * Essential Porridge Blends – a range of three fruit porridge breakfast blends. * Essential Flapjacks – a range of eight flapjacks, vegetarian and vegan, made from traditional ingredients. It is with good reason that oats feature so prominently in the Essential range. Oats are rich in vitamins, minerals, fibre and protein. Eating a bowl of oats in the morning has been shown to support cardiovascular and heart health and protect against the development of heart disease and certain cancers. 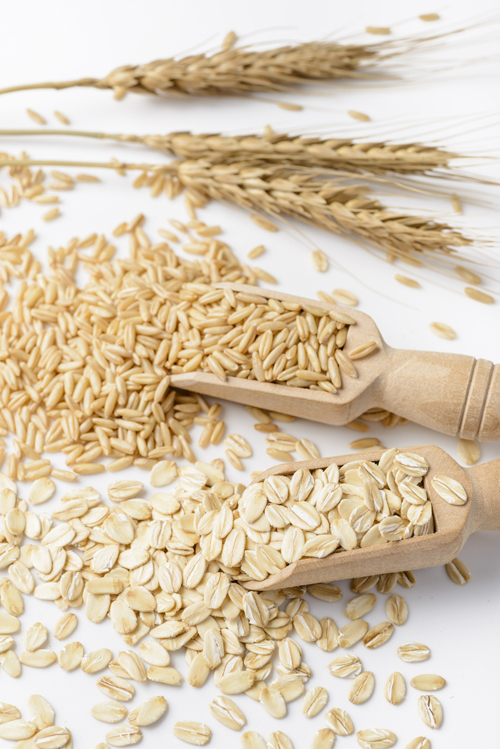 Whole grain oats contribute blood sugar balancing properties, antioxidant compounds, as well as immune enhancing beta glucans (which contribute to the maintenance of normal blood cholesterol levels). Essential Trading has partnered with Italian artisan pasta brand La Terra e Il Cielo (The Earth & The Sky) to distribute the award-winning range exclusively in the UK. The long lasting relationship between Essential Trading and La Terra began at the turn of the millennium at the trade fair Biofach. To celebrate this enduring partnership, Essential Trading is delighted to unveil the stylish new packaging designs for La Terra’s range. The fresh black and white graphics have a modern yet distinctly retro feel, inspired by the heritage and typography of iconic Italian packaging design. La Terra is a thriving co-operative, established in 1980 in the Marche hinterland in central Italy, to the East of Tuscany and Umbria. Here La Terra has pioneered organic production for 35 years, and is committed to manufacturing using all-Italian raw materials. The company harnesses the combined efforts of more than 100 small producers and growers, guaranteeing them a fair price for organic, ethical and socially responsible agriculture. The ethos behind La Terra is very much in keeping with the culture at Essential Trading. Both businesses are co-operatives, and this mutually supportive working relationship is exactly what the co-operative movement is all about. La Terra works hard to protect regional traditions and methods, and maintain the authenticity that is at the heart of their range - and this translates into flavour! The team manages all the different stages of the production chain, from the sowing of the (non GMO) seeds to the selling of the end product. This includes growing, threshing, storage, milling and last but not least pasta making. This traceability guarantees the ultimate quality for the range. La Terra takes pride in researching and reviving old varieties of cereals such as spelt and durum wheat, to preserve their individual characters, flavours and nutrients. The milling of the wholemeal products is done in La Terra’s stone mill, powered by water turbines. La Terra was the first company in Italy to be built using bio-architecture and green building techniques. The main pasta factory, located in Teramo, is a family run business proudly handed down through the generations since 1874. Conventional pasta production involves drying pasta at high temperatures of 120°C but La Terra pasta is dried at much lower temperatures of between 45°C - 50°C. Although it takes longer, these optimal temperatures and traditional techniques preserve the amino acids, nutritional value and flavour, and give the pasta a unique character. 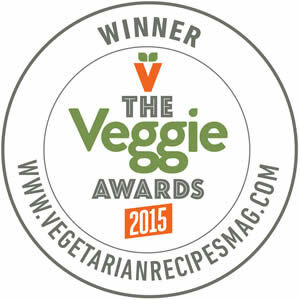 Essential Trading is thrilled to announce that its Organic Peanut Butter has won the award for best Vegetarian Store Cupboard Ingredient in The Veggie Awards 2015. “One of my favourite ways to use the Essential Organic Peanut butter is as a Satay sauce, which is so easy to make. Soften a couple of chopped spring onions in 1 tbsp of rapeseed oil for 2 minutes, then add 3-4 tbsp Essential Organic Peanut Butter, 1-2tbsp vegetarian red Thai curry paste, 1 tbsp soy sauce, 1-2 tsp grated ginger, and gradually stir in 400ml can of organic coconut milk. In this thick state, it makes a lovely dip for fried smoked tofu. Or stir 200ml boiling water into the mixture, add lightly-cooked mange touts, sliced carrots, baby sweetcorn and red pepper. Scatter with chopped coriander, and serve with plain rice”. With some brands of peanut butter adding cheap vegetable oils to their products, it’s good to know that Essential’s range of Organic Peanut Butter is made from pure peanuts, and no unwanted ingredients. 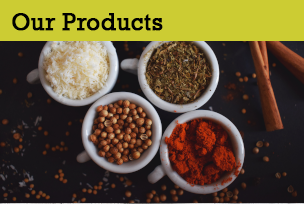 Other commercial nut butters often contain added hydrogenated fats (trans fats) or palm oil (which apart from having fewer nutritional benefits also raises questions of sustainability). Then there is the possibility of excess salt, added sugar, monoglycerides (binding agents) and preservatives. Essential’s range is made from lightlytoasted, organically grown peanuts, so every mouthful is packed full of sustainable goodness. Essential source their peanuts from organic growers who raise their crops without chemical fertilisers, pesticides or herbicides. Conventionally grown peanuts are at risk of contamination from pesticides because they have a thin skin and lack a hard shell, so they absorb a lot of the chemicals.